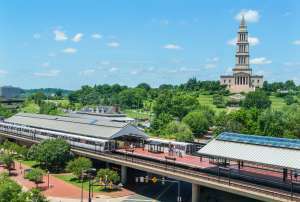 With street parking, lots and garages in Old Town just steps from chef-driven restaurants, independent shops and boutique hotels, parking in Alexandria is easy. Parking is free in many parts of the city, including Del Ray. Visitors to Old Town will find 19 parking garages and lots, many as low as $5 a day, as well as metered street parking on and just off of King Street. For insider tips, check out our How to Park in Old Town Alexandria blog post. Street parking spaces in Old Town and Carlyle are free after 9 p.m., on Sundays and on state holidays. Del Ray offers free parking. Throughout Old Town, visitors will find metered street parking for two- and three-hour limits. Metered spots are located throughout Old Town. Some streets feature meter stations that accept credit cards and coins while other streets accept app-only payment. Additionally, free two- and three-hour spaces are located just a few blocks off King Street (north of Cameron Street or south of Duke Street). Paying for metered spots in Alexandria is easy with ParkMobile. The app allows users to start and stop their parking sessions, meaning you’ll only pay for the time you are actually parked. The same system is used in Washington, D.C., Arlington County, Montgomery County and Prince George&apos;s County. Simply download the app, create an account and then, when parking, look for the zone number on the blue “P” signs or on a pay station and start your session. Note: Parking time limits still apply so if you are in a spot with a two-hour limit you will need to move your vehicle before adding more time to your session. Handicapped parking is free for up to four hours at single- and multi-space meters. In addition, individuals with a handicapped license plate or hangtag can park more than twice the time posted on signs in time-restricted parking zones. There are 14 parking garages throughout Old Town from the waterfront to the King Street Metro. See the listings below for addresses, hours and rates. Many garages and lots offer great rates such as a maximum of $5 after 5 p.m. weekdays and on weekends. TIP! Located centrally in Old Town by City Hall and the Alexandria Visitor Center, the Market Square Garage (108 N. Fairfax Street) is just $5 all day on Saturdays and Sundays, $5 weekdays after 5 p.m., and $2.50 per hour or $10 all day on weekdays before 5 p.m. Plus, parking in the garage is free during the Old Town Farmers’ Market each Saturday until noon.